MGMOB-004 Metal Windmill Wind Mill Measures 18 inch wide, 18 inch long & 21 inch Tall .Blade turns freely all metal constructed & Built very durable for play & transporting. Best for year round outdoor use 5 year warranty on w..
MGMOB-007 Covered Bridge Covered Bridge Measures 14 inch wide, 23 inch long & 17 inch tall. Made from all metal construction. 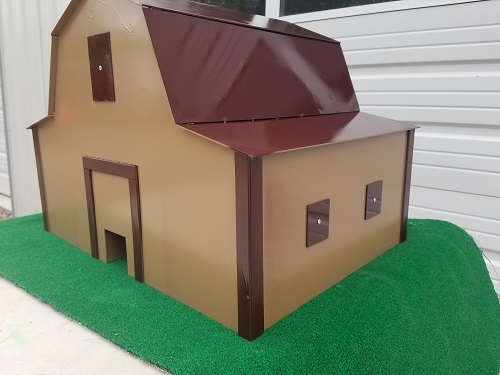 Has been covered in aged wood for looks only.Built very durable for play & transpor..
MGMOB-008 Metal Barn Metal Barn all metal constructed & Built very durable for play & transporting. Best for year round outdoor use 5 year warranty on workmanship. Shipping:FREE SHIPPING!!! *Please contact us for intern..